Accurate flexibility that overcomes most sub-floor imperfections. Designed for optimal joint stability and foot comfort. 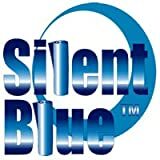 FREE ROLL OF SILENT BLUE TAPE with each purchase of 400 sq. ft.
You won’t find an independently tested floating floor underlayment with more sound or moisture control. 7 out of 10 new floating floor buyers complain about the hollow sound associated with their floor. Do not forget to make your new floating floor easy on the ears.